Above: Celebrity Eclipse on its approach into Dublin Port. For the past few months, anyone with an eye on the River Liffey or a view of Dublin Bay will have seen a striking number of magnificent cruise ships make their way into Dublin Port. For some time now, Cruise Dublin and the Dublin Port Company have been on a mission to raise the profile of the capital as a luxury cruise destination and it looks as if their efforts are really starting to pay off. 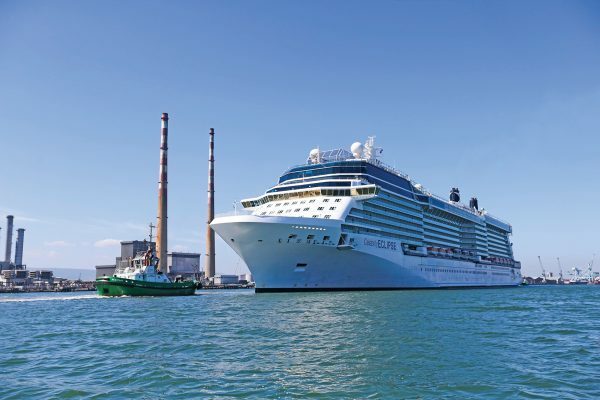 The number of cruise lines adding Dublin to their itinerary has grown steadily, and with the arrival of the Solstice Class, Celebrity Eclipse, on May 10th, cruise traffic through the port looks set to increase even more in the coming months and years. On her maiden voyage to the city, the 317-metre Celebrity Eclipse called to Dublin Port on a glorious summer morning and tied-up at Ocean Pier 33, off the Alexandra Road, where those on board were greeted with an Irish-themed welcome of music and dance. The 17-deck ship was carrying over 4,000 guests and crew, many of whom were on deck as she made her way to the quayside. Amongst the arriving passengers were 400 cruise industry leaders, including the President and CEO of Celebrity Cruises, Lisa Lutoff-Perlo, accompanied by Jo Rzymowska, Managing Director of Celebrity Cruises, UK & Ireland. Lisa Lutoff-Perlo is one of the most important players in the international cruise industry. Appointed President and CEO of Celebrity Cruises in 2014, she was the first woman to lead one of Royal Caribbean Cruises Ltd (RCL) cruise line brands – and the first and only woman CEO of a cruise line that’s publicly traded on the New York Stock Exchange. Although she is in demand all over the world, as CEO and President of the line, Ms Lutoff-Perlo chose to take her ‘President’s Cruise’ to Ireland this year, a huge honour indeed. 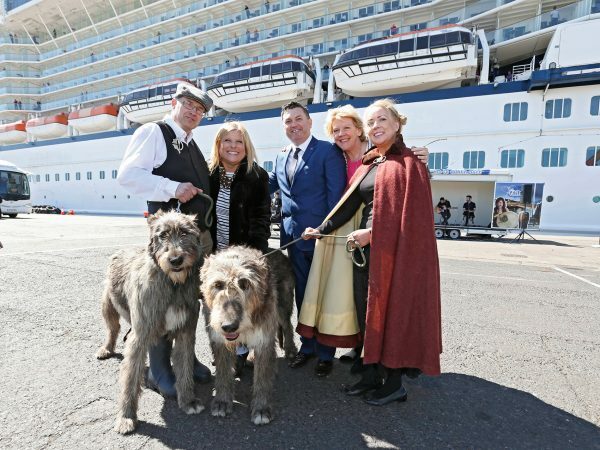 She clearly enjoyed the quayside reception and was especially charmed by two Irish wolfhounds, Ciaran and Danú, who came all the way from Kildare with their humans, Christina and Hugh Kelly, to greet the visitors and remind them that they were indeed in Ireland. Pictures by Conor McCabe Photography. She went on to confirm Celebrities’ plan to “home port” the Celebrity Eclipse, one of the flagships of the company’s fleet, in Dublin Port, from April through June, 2018. The cruise line will offer an increased number of trips that include Ireland as a destination in the coming years. The Eclipse’s 2018 mini-season will include five sailings starting in Dublin; two 10-night cruises to Iceland and one 12-night cruise of the British Isles, which will include a visit to the French Open Ladies Singles Final. Norway will be another destination on offer from the port. This ship epitomises luxury cruise travel. Onboard, guests have a choice of 13 restaurants and cafes and one of the largest wine collections at sea. This is in addition to a spa and solarium, a lawn-club (which includes half an acre of real grass lawn on the top deck), numerous swimming pools, a casino, theatre, boutique shopping, a basketball court, an art gallery (with some very valuable art), a library, and an internet café, amongst other facilities. It also has legendary Suite Class accommodation with butler service. The Celebrity Eclipse is just one of an increasing number of longer cruise ships requesting to call at Dublin Port. This year, seven of the ships which are scheduled to call measure longer than 300 metres, taxing the port’s operational limits. Ships greater than 300 metres in length cannot turn within Dublin Port and are therefore brought stern first (reversed) up the River Liffey. This complex manoeuvre will no longer be necessary once Dublin Port’s Alexandra Basin Redevelopment (ABR) Project is complete. Larger, longer ships will then be able to routinely call at the port and turn within the expanded Alexandra Basin West and berth further upriver, closer to the city at the Tom Clarke Bridge. The planned redevelopment is expected to result in an extra 600,000 tourists for the city annually, three times current visitor levels. With an average ‘spend’ of €100 per passenger, this will have significant knock-on benefits for the local economy, promising increased revenue for bars, restaurants, shops, tour guides, tourist attractions, coach drivers, taxi services, and entertainers, as well as for a couple of very large, extremely hardworking, wolfhounds.